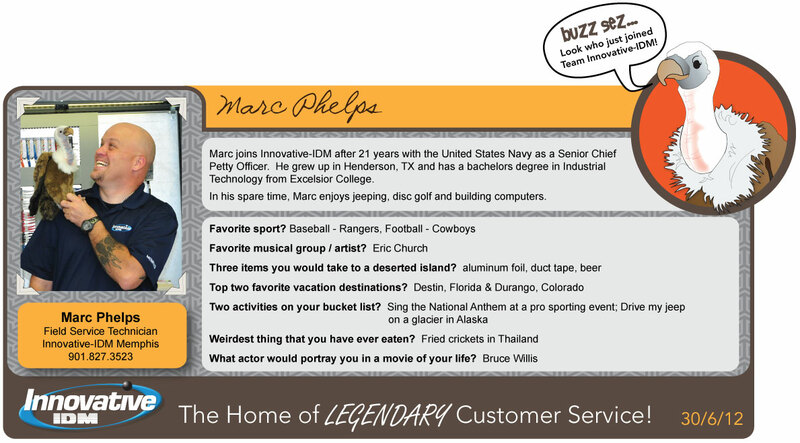 Join Buzz in welcoming Marc Phelps, our newest Field Service Technician in Memphis! Marc joins Innovative-IDM after 21 years with the U.S. Navy as a Senior Chief Petty Officer. He grew up in Henderson, TX and has a bachelors degree in Industrial Technology from Excelsior College. In his spare time, Marc enjoys jeeping, disc golf and building computers. Make sure your repair service offers free estimates, no evaluation fee and turnaround times that suit your needs. In fact, we’ve even got a free guide to repair services you should check out. How to Choose a Repair Service for Your Industrial Electronics from Innovative-IDM on Vimeo. Reason #2,841 to Work at Innovative-IDM: Press Your Luck. No Whammys! Drink Machine in Dallas has a special flavor called “Press Your Luck.” Diet and regular versions are available. You never know what flavor you might get. Remember, No Whammy’s! 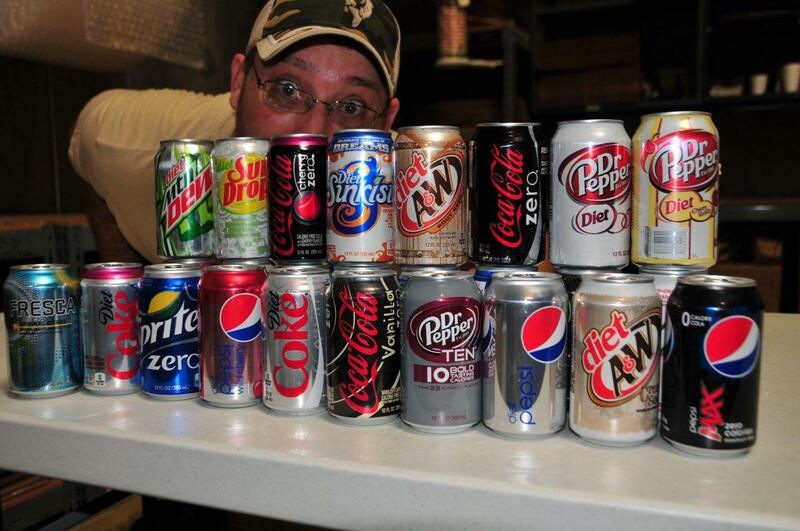 So far, nobody has learned Drink Machine’s algorithms like this guy. 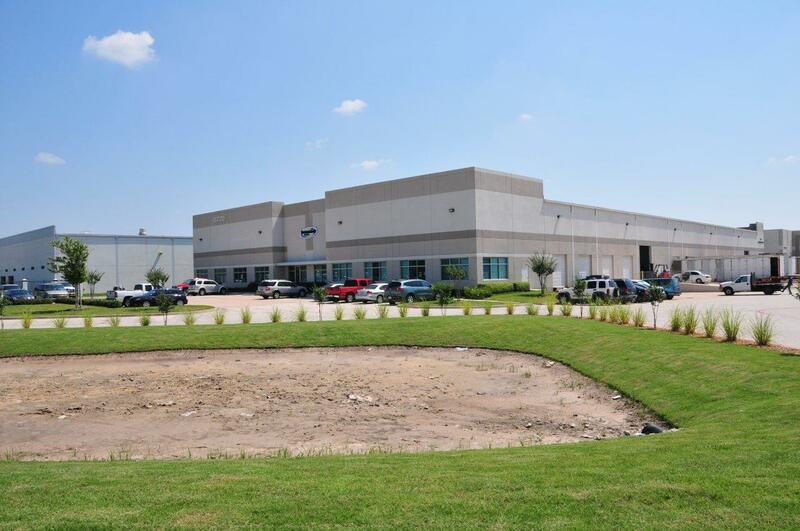 What Do I-IDM Houston and Wittenstein Have in Common? 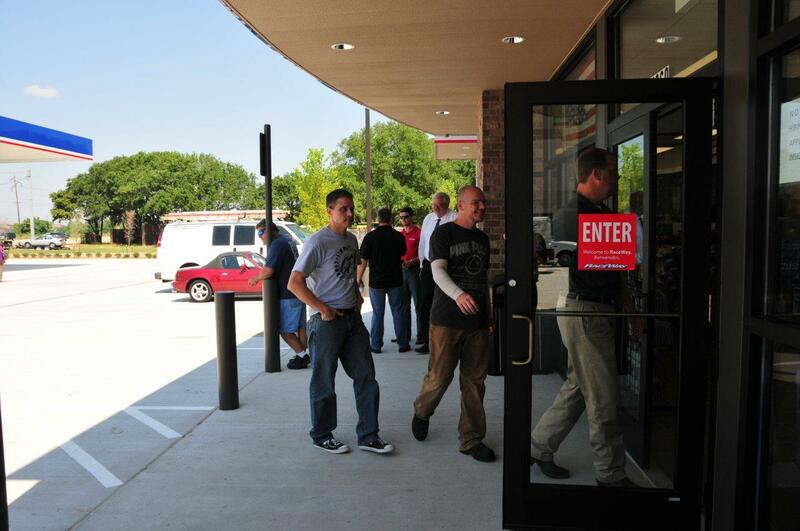 A new RaceWay gas station and convenience store recently opened in a shared parking lot with our Houston office. One of the perks of the construction was a new “retaining pool” behind the RaceWay. 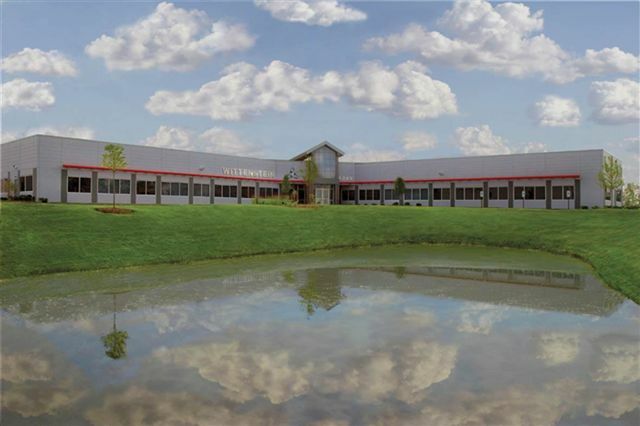 I couldn’t help but think of the resemblance between Innovative-IDM Houston (middle photo) and Wittenstein’s US HQ in Bartlett, Ill. (Top photo). I guess the main difference is there is water in Wittenstein’s pond. And without water, I guess our pond is really just a ditch. The dramatic photo at the bottom shows thirsty Innovative-IDM employees stampeding the RaceWay on opening day. That’s Houston operations manager Charles Manning with the nonchalant look of hands in pockets as he sashays toward the door, trying not to draw attention to himself. But don’t let that conservative approach fool you; seconds later, he had recklessly squandered $1.49 of his family’s savings on a Crush drink. Parker evidently is stepping it up on the turnaround time for its newest actuators. The total specs are here, but 10-day lead time is excellent and much appreciated by all of us here and Innovative-IDM and our customers. 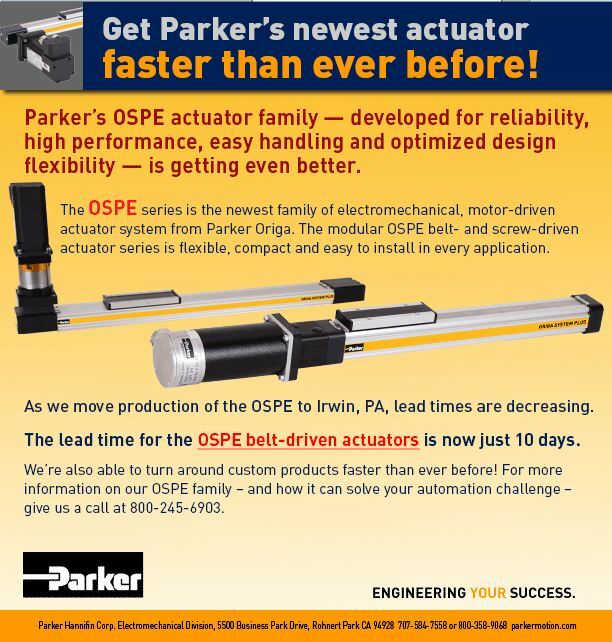 The Parker OSPE..B belt driven linear actuator is a cost effective solution designed for light to medium industrial applications requiring high speeds and long travels. The OSPE..B comes standard with an internal slider bearing guide, and is part of the Origa System Plus family, a family well known for high performance, high quality and low cost of ownership. Innovative’s Tim Mueller is driving to Lubbock, Texas, today. Has an appointment out there today. On they way, he snapped this photo in Post, Texas. 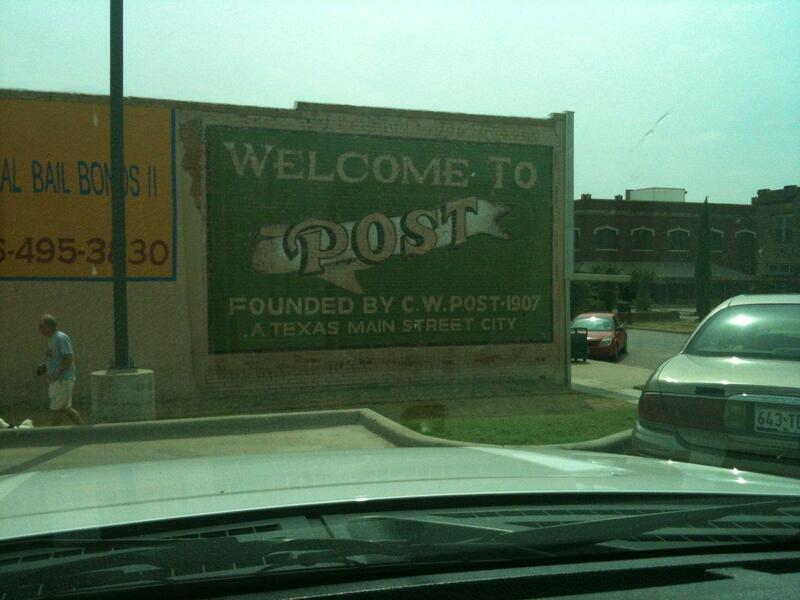 Post, situated above the caprock, was the source of grain to the cereal factories in Michigan beginning in the early part of the 20th Century. BTW, did you know US 84 runs from the Atlantic Ocean to the Rocky Mountains, including stops in Tenaha, Timpson, Bobo and Blair? Last week, one of our field service technicians spent seven days working in an oil/gas field site in BFEgypt. Actually, it was near Midland, Texas 90 miles away from the nearest town, and the temperature was between 102 and 108 each of the days Donald Poehl was on the job. “But it was a dry heat,” says Poehl. That’s a 600HP Yaskawa/Omron drive in that enclosure that Poehl is working on. If you are down, we can fix it. 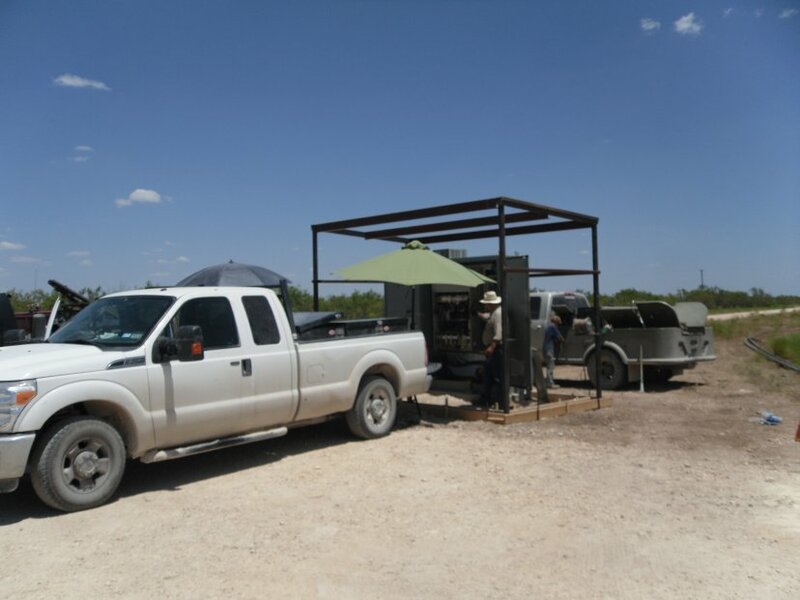 Our field service is nationwide and 24/7.